Product prices and availability are accurate as of 2019-04-14 18:53:28 UTC and are subject to change. Any price and availability information displayed on http://www.amazon.com/ at the time of purchase will apply to the purchase of this product. The Sunshine Resin Dining Arm Chair - Set of 4 features a versatile and durable design perfect for the outdoors. Made of commercial grade, resin plastic, this dining furniture is U. V. resistant. With rubber caps on each leg, these chairs stay in place and won't scratch the floor. These outdoor chairs can be stacked when it is time to store them. 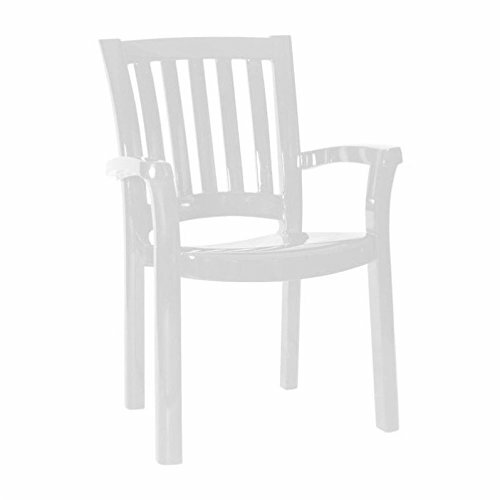 These chairs are easy to clean, able to stand up to everything from chlorine to salt, stains to suntan oils. The slated design allows water to pass through. Comes in white. Assembly level/degree of difficulty: No Assembly Required. 36" H x 23" W (Width between the arms: 17 1/2" ) Made from commercial grade resin with gas injection molded legs, with non-skid rubber caps. Extremely durable for outdoor temperatures. Resistant to U.V, chlorine, salt, stains, suntan oils. Easy to keep clean. Perfect for heavy use in any indoor or outdoor areas. Stackable for easy storage.